Every day, we are SO excited to see and share YOUR work across our platforms. As part of this community celebration, MODERN SALON has a long heritage of spotlighting game-changing salon pros who inspire, innovate and share their voice and artistry-allowing US to share it with the world of professional beauty. This year, we honor more artists than ever before by devoting nearly the entire August issue to our amazing community. Introducing this year’s MODERN SALON 100: Celebrate these inspiring stylists, learn how they grew their social and industry presence, see how Instagram changed their lives, and get inspired to take your own career to the next level. As always, MODERN is here to help the next generation of influencers grow. Watch for more inspiration and ideas. Most important, be passionate and purposeful in all you do in your beautiful professional journey. We are proud to honor this year’s #modernsalon100 and can’t wait to feature hundreds more in the years to come. What’s next? Who’s next? You’ll show us! SEE THE 2017 MODERN SALON 100 HERE! Every year in our Game Changers issue, MODERN SALON editors feature our favorite social media influencers. We annually spotlight between 15 and 20 Instagram personalities; big names like @guy_tang, @mustafaavci, @xostylistxo, @andrewdoeshair, @anhcotran and @taylorrae_hair have all graced these pages. It’s one of our most talked-about issues of the year. And the exposure isn’t limited to our community—these features transform careers. Because our industry is hyper-visual, it’s no surprise Instagram is the online platform of choice. As Instagram continues to ramp up its offerings with filters and stories (bye, Snapchat), Instagram Live (RIP Periscope), and even promoted posts (sorry, Facebook)—the platform offers everything the salon professional needs to market, network, inspire and get inspired. 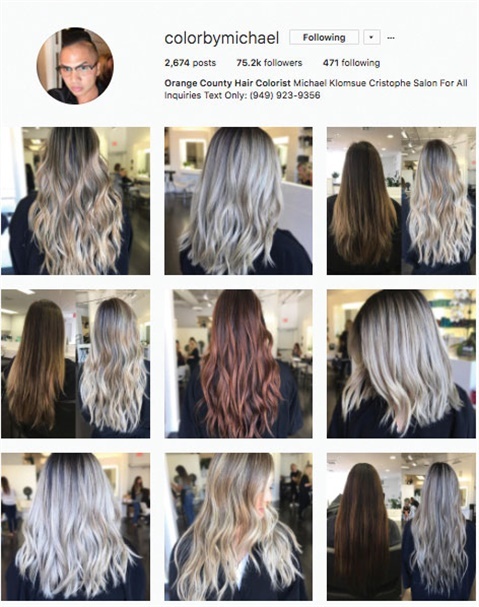 Instagram has changed the lives of salon professionals around the world: From access to limitless education from tutorials and formula posts, connecting with major beauty brands and feature pages, and forming friendships with like-minded stylists. When our editors started to put together the 2017 who’s-who of beauty influencers, we talked about how to best organize this list. We felt strongly to not sort it by number of followers. We talked about sorting it by specialty but, because Instagram has completely leveled the playing field as far as access to celebrity and exposure goes (no longer are NYC and LA stylists the only ones with limitless opportunities! ), we ultimately decided to organize it by location. Scope out @colorbymichael's handle and bio. WHO ARE THE MODERN SALON 100? First and foremost, they’re salon professionals just like you. It’s when you compare their work side-by-side you can see that, though there isn’t a definite check-list in the way they all post, there are a lot of similarities. Instagram handles (the username that follows the @ symbol) should be straightforward—your full name—or a clever name that says who you are and what you do. Some of our favorites: @hair_princess_steph, @phildoeshair, @updosbykarina, @hannahthepainter, @camouflageandbalayage. Underscores are okay, but limit the number of them. The profile photo should be of you or your salon. A good bio tells us who you are, where you’re located and how to contact you. It also shares your specialties (balayage, men, pastels, etc). Here’s where you can share with clientele how to book an appointment and if you’re accepting new clients. Natural lighting is key—a flash creates a glare and makes every piece of frizz stand out. However, a ring light can make the most immediate difference in your photos, and it’s exactly what it sounds like: a ring-shaped light. If you look at @modernsalon’s page, most of the work we feature is from the side or the back—faces are rarely shown. 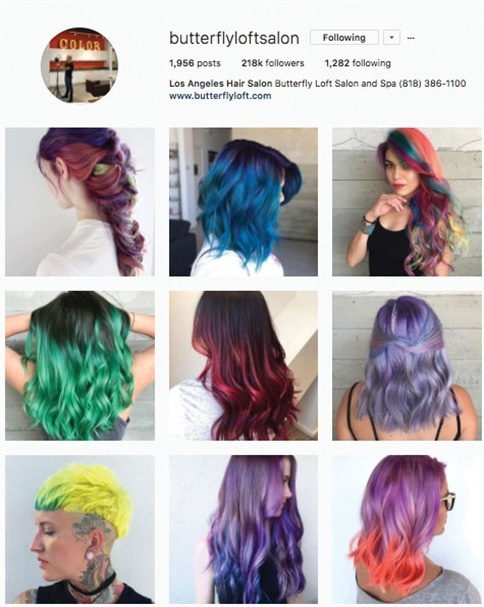 Successful pages have a signature background (poke around @guy_tang’s or @butterflyloftsalon’s pages for inspiration). It’s good to have a mix of stills, videos of the process and a before/after split pic. Don’t ever Photoshop or alter the hair—it’s fine to blur the background or fix a blemish, but don’t touch the hair. There is a hot debate about whether or not to watermark your images (an identifier on images to clarify where it originated). We are pro-watermark if done in a tasteful way that doesn’t distract from the overall image. In your captions, limit your use of hashtags,and tell your audience what you did and how you created your look. If you’re using professional hair color, don’t be afraid to share your formulas. We love when stylists title their work: Rose all day, garden-party perfect, copper queen. Keep the caption concise, and include the products and tools you used. “Use your caption as a call to action so people are compelled to comment and engage with you,” says Alison Valsamis, @braidedandblonde. Although hashtags are an incredible tool to find new content that’s relevant to your interests and improve the visibility of your own posts, many over-hashtag and the abuse has prompted Instagram shadowbanning—or at least that’s the rumor—when hashtags become “undiscoverable” in an effort to limit spam-y pages and bots. Worried you’re being shadowbanned? Ease up on your hashtagging, mix up your list of tags, tag locally (#miamistylist #miamisalon), and be as specific as possible (only use #colormelt if it really is a color melt, not just because it’s a popular tag). Our favorite piece of advice to gaining more exposure is to be active in the community. Comment on posts you love—don’t just “like.” Social media doesn’t just give you a voice and the ability to inspire, it also validates other voices and prompts the inspiration to keep owing. “Always respond to comments and create dialogue in your posts,” says Stephanie Geib, @hairbystephscissorhands. Instagram also sorts comments under posts—no longer appearing in chronological order, our observations show that accounts with the most followers and engagement appear before expanding to the full list of comments. So the more you like, the more you show up, the more people see your name. Want to catch our attention and get featured on @modernsalon? Make sure you're following us and using #modernsalon! We're always looking for our next featured artist. The more you post, the more we see you!